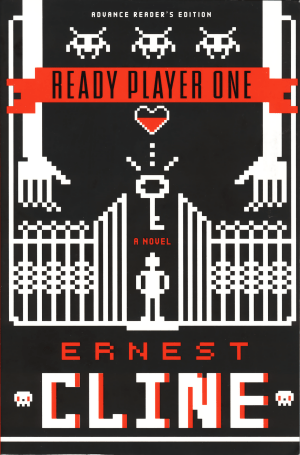 Ready Player One by Ernie Cline is what a dystopian future should look like. Economy in the toilet, energy depleted, trailers stacked dangerously close. Most kids going to school in VR called OASIS and the 80’s has made a comeback by way of a Jobsian / Hughes-like computer programer named James Halliday. James Halliday is D+D playing social outcast when he meets Ogden Morrow. Over the years the two would go from creating games in their basement to forming a company and becoming millionaires. During those years they build a giant VR world called Oasis which only costs a quarter to join. Years later as society slowly crumbles, Halliday, upon his death mass emails everyone on OASIS and says if can decipher my riddle, play my game, get the three keys, win then you would become CEO of my company and get all my money. There’s a part of me wonders if this book had come out before SDCC if the panel I attended with Cline as one of the speakers would have been more popular and longer than it was because this is so much geek name checking in this book it boggles the mind. Our protagonist is Wade Watts (yes, his father liked Peter Parker and Clark Kent) and he is one of the few, the proud, a solo Gunter that is scraping dimes together in real life and virtual to keep up his addiction. He along with a great many other OASIS users have searched for years to find Halliday’s game, play it and win but so far success has been fleeting. OASIS started off as a VR Game and then spread forth to become what the Internet/MMOs are going to become sooner or later: an open sourced, globe spanning, Second Life MMO. The plot is fairly straight forward David VS. Goliath. Wade and his Gunter friends find the first key are pitted against the Innovative Online Industries a global communications conglomerate and ISP that has been trying to buy out Halliday’s company for years. The entire cast feels fairly well thought out with the exception of the villain, Sorrento. Sorrento is your standard stock villain he does not chew the scenery but he does not stand out either. I wouldn’t have minded an Emperor’s Hand lackey, a red hearing is set up early in the book but it doesn’t come to fruition but I think that may be the only downside to this book. There is no physical Kurgen or T-1000 licking at Wade’s heels even though IOI is seen as Jaws but Jaws feels toothless in the end. The stakes raise pretty quickly in the book as characters are dispatched here and there forcing the Gunters to move across the board and out into the world outside their computers. The Universe building is easy to follow and does not take that much of a stretch of the imagination to see that the real world may be headed in the same direction in a few years, months, minutes, seconds. The 80’s / geekdom references in this book feel real instead of “oh let’s just say it for the sake of saying it”. Halliday’s love of geek and the 80’s really makes this book stand out because of the work that Cline and his reference checkers did. Overall, it’s a fun, fast book to read. I highly recommend reading the book and bookmarking Cline’s blog. An international book cover, found there was used in the post and is different than it’s neon red and yellow US Cousin. Cline has posted a few videos of his DeLorean as he’s modding it piece by piece as seen here. Here’s hoping when the movie adaptation does arrive it does not follow the same track as Cline’s first screenplay, Fanboys. This entry was posted in Books, Geekdom, Reviews and tagged book review, Geekdom, viva la 80's by RK Bentley. Bookmark the permalink.